The Das Keyboard 4 Professional for Mac is a great alternative to Apple’s own keyboards. The Das Keyboard is much more comfortable to type on. It’s also designed to be used with Macs and comes with Mac-specific keys, whereas most non-Apple keyboards are designed for the Windows operating system. It’s a bit pricey, but it could be a worthwhile investment for those whose jobs or hobbies involve a lot of typing. One look at the keyboard above, and you’re probably thinking I’d be crazy to tell you that this is the perfect keyboard for Mac users. It’s completely contrary to Apple’s recent keyboard designs, which are sleek, thin, and barely have any key “travel” – the distance that a key travels when you press it. Indeed, this keyboard doesn’t match Apple’s clean, modern aesthetic at all, and that’s probably one of the reasons why Apple doesn’t sell it on its website or stores. But if Apple’s keyboards – whether on its laptops or desktops – don’t have all the keys you need, or you find them uncomfortable to type on, I’d recommend you check out the $170 Das Keyboard 4 Professional for Mac, which I’ll simply be calling the “Das” from now on. If you don’t like the shallow key travel on Apple’s keyboards, the Das is the absolute opposite. The Das’ keys have a lot of travel. That may seem inefficient compared to the incredibly shallow key travel on Apple’s keyboards, as you need to press keys further down to register a keystroke, but I didn’t notice that my typing was any slower. The biggest thing I did notice while typing with the Das is how much more comfortable it was compared to Apple’s keyboard, especially for longer typing sessions. The longer key travel on the Das felt like it was cushioning the tips of my fingers when I pressed a key. It’s almost like typing on a cloud compared to Apple’s Magic Keyboard, which feels like tapping on a solid piece of wood in comparison. The Mac model of the Das has almost all the keys from Apple’s own keyboards, whereas most non-Apple keyboards are primarily designed for the Windows operating system. The Das keyboard for Macs comes with almost all the keys you’d expect on Apple’s own keyboards, including the “Cmd” key, the “option” key, media controls, volume control, screen brightness control, and even a CD eject button. It also has a few nifty features that you wouldn’t find on Apple’s keyboards today, like a couple USB 3.0 ports, a large volume control knob, and a sleep button that immediately puts your Mac to sleep. 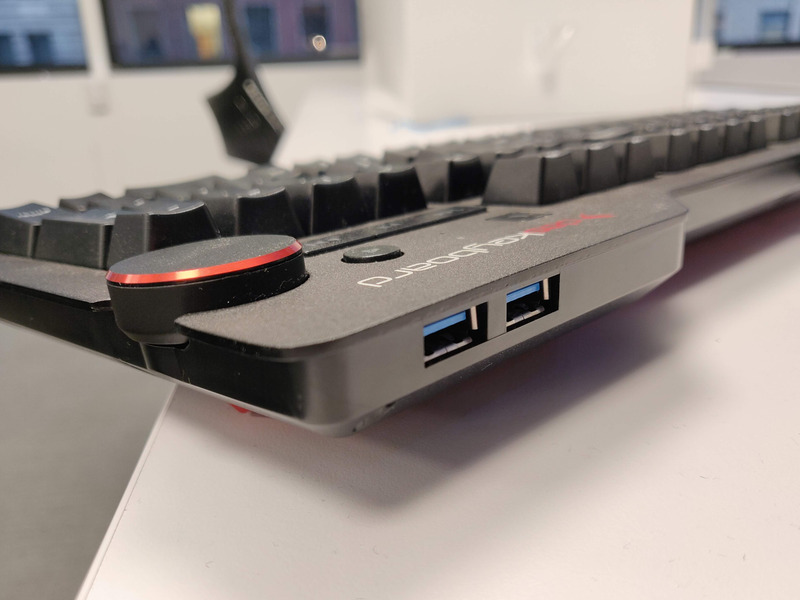 The USB ports, in particular, are incredibly useful to have on the Das keyboard. I can plug in the wireless dongle for my wireless mouse there, as well as quickly plug in any USB accessory. It’s just nice to have a couple extra USB ports. The Das is a ‘mechanical’ keyboard, which are known to make a lot of noise. But the Das model I’ve been using hasn’t bothered anyone in the office so far. Mechanical keyboards are often associated with a loud typing noise, but the Das I’ve been using uses a specific type of switch that’s actually relatively quiet. For anyone who’s curious as to which switches the Das comes with, the model I’m using now has the Cherry MX Brown switches, which aren’t that noisy, but they’re still noisier than Apple’s keyboards. Still, no one in BI’s open office setting has complained about the keyboard so far, and I’ve been asking around to make sure. You can also get the Das for Macs with Cherry MX Blue switches, which make a significantly noisy, high-pitched “click” noise every time you press a key, and it’ll likely bother everyone around you. I wouldn’t recommend the Blues for an open office environment. To use the Das with a Mac is to value function over form. You’ve probably noticed that the Das doesn’t exactly look very Apple-like. 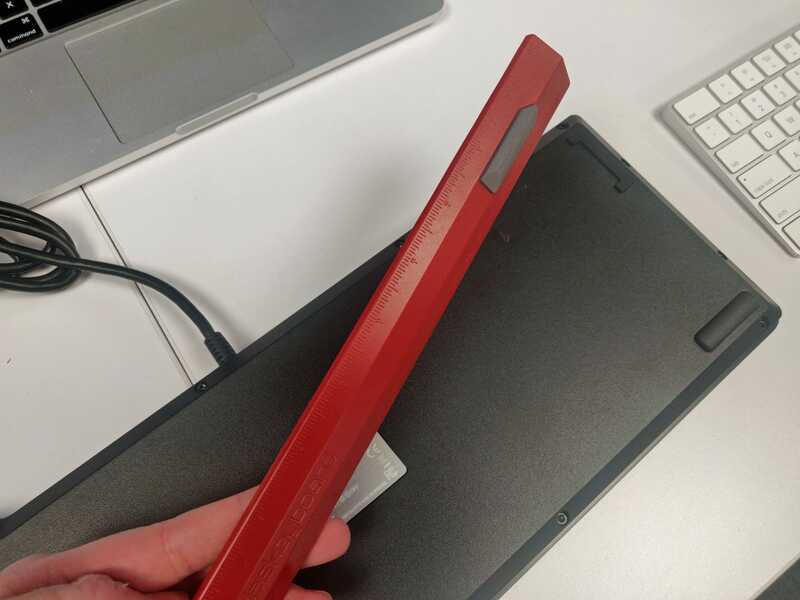 It’s large and chunky, the keys are incredibly tall compared to Apple’s flat key design, and it has some red accents that clash with Apple’s aesthetic. Further, the Das is not wireless and uses a rather generic-looking – ugly, even – cable to connect to your Mac. For many, almost any cheap keyboard with greater key travel will feel more comfortable than Apple’s keyboards, which makes the Das’ price tag a little steep. Indeed, the Das for Mac is a bit of an investment with its $170 price tag. You can get cheaper non-mechanical keyboards with similar key travel and better comfort than Apple’s keyboards for significantly cheaper. With that price tag in mind, it’s tough to fully and outright recommend the Das for Mac. But if you type a lot for work or play, a little investment into a keyboard as good as the Das Keyboard 4 Professional for Mac could be worthwhile.